This Fourth of July, many Americans will fire up the grill to cook for their families and friends. But choosing safe, sustainable meat to grill can be confusing. Follow EWG’s tips to pick the best meat for your holiday weekend cookout. 1. Choose meat that is produced without antibiotics or hormones. More than 70 percent of the antibiotics used in the U.S. are administered to livestock in crowded feedlots. Until recently, these factory farms were permitted to add antibiotics to animals’ feed to make them grow faster. The Food and Drug Administration recently issued guidelines which encourage livestock producers to stop using antibiotics for growth. But there’s no telling if this guidance will actually reduce antibiotic use, which continues to rise each year. Overuse of antibiotics is one of the top five threats to public health, according to the Centers for Disease Control and Prevention. Each year 23,000 Americans die from infections of antibiotic-resistant bacteria. And this week, a second U.S. patient was found to be carrying the antibiotic-resistant mcr-1 gene, which is unaffected by all antibiotics on the market. 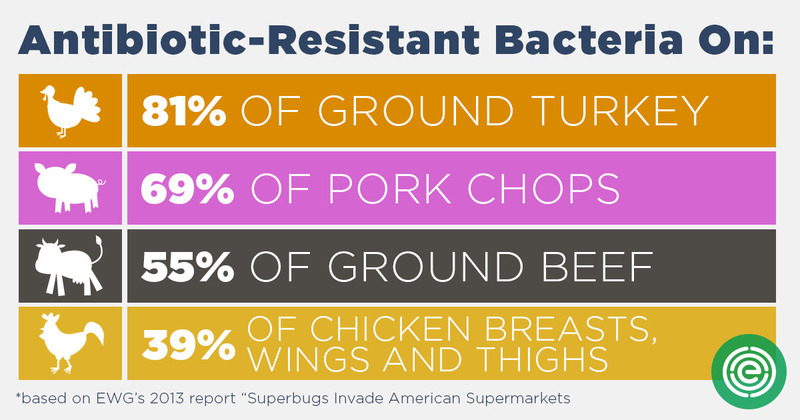 A 2013 EWG analysis of U.S. government reports showed that antibiotic-resistant bacteria had been detected in 69 percent of raw pork and 55 percent of raw beef tested by the federal government’s scientists. As scary as that is, there are simple ways to avoid meat treated with antibiotics. The best way to avoid meat raised with antibiotics is to choose meat with the Department of Agriculture Organic seal. USDA Organic standards require that no antibiotics are used on animals. Also, the Certified Humane program restricts antibiotics from being added to feed for growth promotion. Check out EWG’s Food Scores to learn more about meat and poultry raised without unnecessary antibiotics. 2. Avoid nitrates and nitrites. Processed meats such as ham, bacon, lunch meats and hot dogs often contain nitrates or nitrites – often in the form of sodium nitrate. These are added to prevent the growth of harmful bacteria, to enhance color or add a smoky flavor. Eating meat treated with nitrates may increase the risk of cancer and other health problems through the formation of nitrosamines. Once again, EWG’s Food Scores can help you find meat and hotdogs free of harmful nitrates and nitrites. 3. Choose chicken, pork, or pasture-raised beef instead of grain-fed beef. 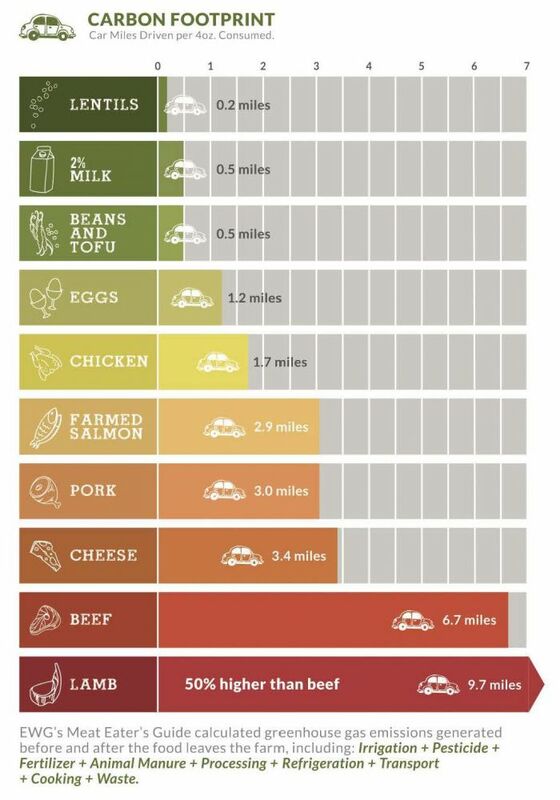 It turns out that choosing between hot dogs made from chicken, pork or beef can make a big impact on your climate footprint. For example, if every American simply switched from beef to chicken, we could reduce greenhouse gas emissions by 137 million metric tons of carbon – or as much as taking 26 million cars off the road. That’s because cattle produce at least four times as many greenhouse gases as chickens, and 13 times as much as vegetable proteins like beans, according to EWG’s Meat Eater’s Guide to Climate Change and Health. Of course, not everyone wants to switch to chicken hot dogs or black bean burgers, so if you or your family loves beef, look for pasture-raised beef or meat labeled with animal welfare certifications, which require that animals aren’t put in cages and have space to move around. Grass-fed or pasture-raised animals are raised in more humane conditions, have fewer antibiotics, and in some cases may have more nutrients and less fat. And remember, if you plan to grill meat this weekend, make sure to cook it to an internal temperature of at least 160 degrees Fahrenheit. Hamburgers can turn brown before they reach a safe temperature. Always use a food thermometer to ensure that meat is cooked enough to kill potentially deadly E. coli bacteria.